Singapore-based eBay sellers rejoice – eBay Singapore has partnered with SingPost, and in collaboration with US Postal Service, to launch a new shipping service for delivering goods from Singapore to the United States. Called ePAC – short for electronic packet – eBay sellers in Singapore can send lightweight goods of not exceeding two kilograms anywhere stateside within six to eight working days, which would have previously taken up to two weeks. 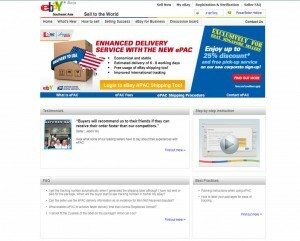 Aside from faster delivery, ePAC is also fully integrated from within eBay – users can take orders, print labels and track shipment status via their “My eBay” account. Similarly, U.S.-based customers can use the tool to track and confirm their orders from Singapore-based sellers, providing greater transparency. “Singapore sellers on eBay are highly regarded for combining good quality products at great value. This is primarily why this market has the second largest sales in Southeast Asia after Thailand,” says Oliver Hua, Chief Operating Officer, Greater China, Southeast Asia and Japan, eBay Marketplaces. Lest you think this feature may not amount to much – according eBay‘s first-ever Asian Exporters’ Index, Singapore-based exporters on the site have the second largest sales in Southeast Asia after Thailand.